Spacecom's AMOS 6 satellite was destroyed in a SpaceX rocket explosion the morning of Sept. 1, 2016, days before its scheduled launch. It was intended to provide broadband for the coast of the US, Europe, Africa and the Middle East. A satellite co-leased by Facebook and intended to bring internet access to parts of sub-Saharan Africa, was destroyed on a launchpad in Florida today (Sept. 1), when the rocket meant to carry it to space exploded. The explosion occurred at approximately 9:07 a.m. EDT (1307 GMT) at Cape Canaveral Air Force Station. The AMOS-6 communications satellite was scheduled to launch on Saturday (Sept. 3), and was already secured atop a Falcon 9 rocket, built by Elon Musk's private spaceflight company SpaceX. Musk said in a tweet posted at 1:07 p.m. EDT (1707 GMT) that the exact cause of the explosion was still unknown, although SpaceX said in the statement, "The anomaly originated around the upper stage oxygen tank and occurred during propellant loading of the vehicle." The launch of AMOS-6 was a collaboration between Facebook and French-based satellite provider Eutelsat Communications, and would have been part of Internet.org, a "Facebook-led initiative with the goal of bringing internet access and the benefits of connectivity to the two-thirds of the world that doesn't have them," according to the Internet.org website. Six other communications companies helped co-found the initiative. "Over the last year Facebook has been exploring ways to use aircraft and satellites to beam internet access down into communities from the sky," Zuckerberg wrote in his AMOS-6 announcement. "To connect people living in remote regions, traditional connectivity infrastructure is often difficult and inefficient, so we need to invent new technologies." 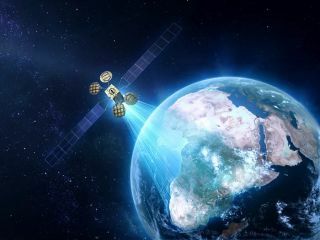 Eutelsat reported that the satellite capacity was "optimised for community and Direct-to-User Internet access using affordable, off-the-shelf customer equipment." The AMOS-6 satellite was owned by the Israeli-based satellite operator Space Communications (Spacecom) and was built in collaboration with Israeli Space Industries. The satellite was estimated to cost $195 million when the plan to build it was first announced. Facebook and Eutelsat had a contract to lease the AMOS-6 satellite for $95 million over 5 years, according to SpaceNews. That article also reported that the contract required Spacecom to purchase an insurance policy "covering project-related risks that would not otherwise be covered by Spacecom's own insurance policy covering the satellite's launch and first year in orbit." At 12:50 p.m. EDT today (1605 GMT), Zuckerberg posted a statement on his personal Facebook page regarding the loss of AMOS-6. "As I'm here in Africa, I'm deeply disappointed to hear that SpaceX's launch failure destroyed our satellite that would have provided connectivity to so many entrepreneurs and everyone else across the continent," he wrote. "Fortunately, we have developed other technologies like Aquila that will connect people as well. We remain committed to our mission of connecting everyone, and we will keep working until everyone has the opportunities this satellite would have provided." SpaceX has recently been making progress on plans to reuse its Falcon 9 rocket boosters, with the successful upright landing of five spent boosters. None of those boosters have yet been used for a second flight. The company's only major flight anomaly took place June 28, 2015, when a Falcon 9 exploded shortly after liftoff. The rocket was carrying supplies to the International Space Station. Rep. Bill Nelson, a Florida Democrat, issued a statement regarding the explosion, according to multiple sources: "As we continue to push the frontiers of space, there will be both triumphs and setbacks. But at the end of the day, I'm confident that our commercial space industry will be very successful." The loss of AMOS-6 could come as a blow to Spacecom, which saw its stock plummet in late November 2015 when its AMOS-5 satellite failed while in orbit. The Chinese conglomerate Beijing Xinwei Technology Group was set to purchase Spacecom following the successful launch of AMOS-6, SpaceNews reported Aug. 24. Editor's Note: The headline of this article was updated at 8:22 p.m. EDT to clarify that Facebook co-leased the AMOS-6 satellite, and did not fund its construction.